Hi folks, looks like spring has arrived call us for all you’re gardening and D I Y requirements and even your BBQ charcoal and gas…which are all in stock!!! !STOP PRESS “Grass seed now in stock”also back in the shop we have a new Carpet cleaning machine for hire at just £30.00 per day ,this includes the cleaning solution ! the deposit is the same at £50.00 with three forms of I.D.please phone for bookings. Richard and John welcome you to the ‘on-line’ home of the Baldock Hardware Store. We are a Locksmith and Hardware shop based, funnily enough (! ), in the pretty market town of Baldock in the north of Hertfordshire. 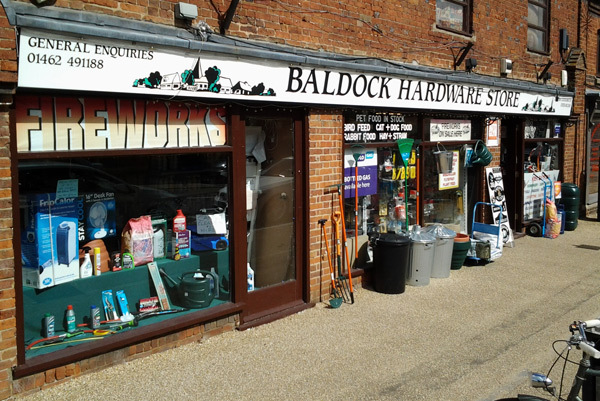 We began the business as ‘Town & Village Security Services’ from a small shop in Bell Row in 1995 – moving round the corner into the High Street 2 years later and becoming the Baldock Hardware Store. The shop continued to grow and, to accommodate this, we relocated to our current premises in Whitehorse Street (opposite the Post Office) in 2002. On the hardware side of the business we stock just about everything for your home and garden. We also have a section for pet supplies – including bird nuts and wild bird seed.As Locksmiths we cut most household keys and a wide range of car keys – including many transponder keys. We supply and fit all types of locks. We also sell everything for your home security needs – including safes.. Please browse these pages to view a selection of our stock and feel free to contact us for more information. As a local business we operate a ‘can-do’ policy and will try and help our customers wherever possible. Shop Opening Times: Monday – Saturday: 8.30am – 5.00pm We open some Bank Holidays (excluding Christmas Day, Boxing Day and New Year’s Day) and some Sundays during the Firework/Christmas season. Please telephone us for up to date opening hours. Baldock Hardware. 27-29, Whitehorse Street, BALDOCK, Hertfordshire, SG7 6QF Tel: 01462-491188. Fax: 01462-894296.